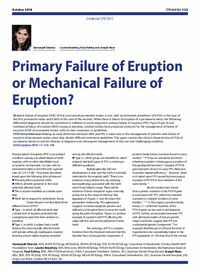 Orthodontic Update: Issue - Article: Primary Failure of Eruption or Mechanical Failure of Eruption? Orthodontics: Primary Failure of Eruption or Mechanical Failure of Eruption? Abstract: Failure of eruption (FOE) of first and second permanent molars is rare, with an estimated prevalence of 0.01% in the case of the first permanent molar and 0.06% in the case of the second.1 When there is failure of eruption of a permanent molar, the following differential diagnoses should be considered in addition to tooth impaction: primary failure of eruption (PFE) (Type I/Type II) and mechanical failure of eruption (MFE) owing to ankylosis. Limited studies have proposed protocols for the management of failure of eruption (FOE) of permanent molars with no clear consensus or guidelines. Clinical relevance: Making an early distinction between MFE and PFE is important in the management of patients with failure of eruption of permanent molars since they dictate different treatment modalities. This paper reviews the clinical characteristics of FOE of permanent molars to aid the clinician in diagnosis and subsequent management of this rare and challenging condition. Author notes: Geetanjali Sharma, BDS, MJDF RCS(Eng), MClinDent, MOrth RCS(Eng), FDS (Orth) RCS(Eng), Consultant Orthodontist, Frimley Health NHS Foundation Trust, Louise Kneafsey, BDS, MSc(Lon), MOrth RCS(Eng), FDS(Orth) RCS(Eng), Consultant Orthodontist, Northampton General Hospital, Paul Ashley, BDS, PhD FDS(Paed Dent), FHEA, Consultant Paediatric Dentist, UCL, Eastman Dental Hospital and Joseph Noar, MSc, BDS, FDS RCS(Ed), FDS RCS(Eng), DOrth RCS(Eng), MOrth RCS(Eng), FHEA, Consultant Orthodontist, UCL, Eastman Dental Hospital, 256 Gray’s Inn Road, London WC1X 8LD, UK. Objective: To explain the difference between PFE and MFE and the clinical implications of misdiagnosis.